From January 2, 2019, Intermediate students are not allowed to bring their cars on campus. However, students are allowed to bring their motorbikes and park on campus after getting a parking sticker for the motorcycle. Students can purchase motorcycle sticker for Rs.600/- The parking sticker will be valid till the last day of classes. 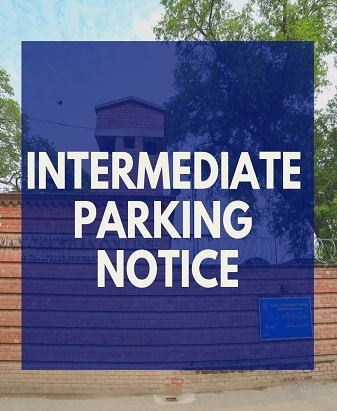 Students cannot park their vehicle on service road because that will be lifted by the city traffic police. The process for getting a parking sticker. 1- You need to submit the registration form along with required documents to Chief Proctor ‘s Office P-025. a) Copy of valid driving license. c)Authority letter on plain paper if the motorbike is not transferred to you.